A very interesting experiment in the power of social networks occurred on Friday. Several higher ed professionals uncovered evidence of a marketing scheme utilizing the very popular incoming freshman “Class Of” groups in Facebook and were sharing their findings on Twitter. Upon further digging they found hundreds of colleges and universities throughout the country with Class of 2013 groups created by the same small group of people. Additional detective work identified a college marketing group behind most of the pages, likely with the intent of mining students’ comments and posts on the Class of 2013 group pages. Our university was the lucky recipient of two of these pages. As we enroll a freshman class in the range of 4,500 students, it is not policy that we create and maintain official class pages for each new group of students. Instead we let the network of Facebook groups develop naturally. 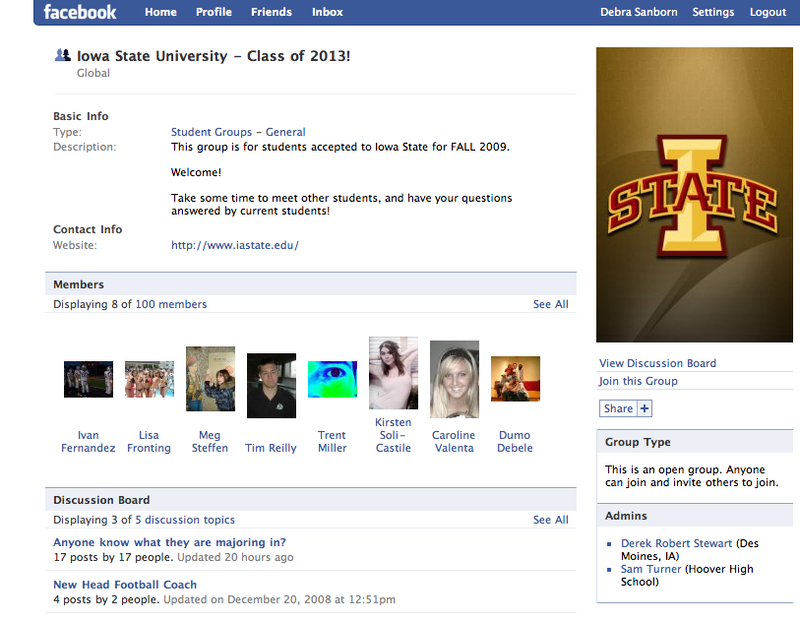 The Class of 2012 group last year had more than 1,200 student members and hundreds of discussion board conversations. Armed with information from the Twitter discussion with other higher ed colleagues, I was able to identify that the Class of 2013 group creators and admins were not prospective students. I posted links to the story on each page and highlighted the group admins that were attempting to pose as our students. Next, I messaged a couple of students who were engaged in the groups and encouraged them to take ownership. By Friday afternoon, the marketing groups had relinquished admin rights on one page and switched admins on the other. I emailed the new admin requesting that he name our students as admins. After a couple of snarky email replies, he gave up his admin rights by the next evening. The students who took admin rights for the pages are now cross-posting on each group and building relationships with the other student admins. We have no official obligation to monitor or engage students on Facebook or other social networking sites to protect them from indiscriminate sharing of information or spam marketing. But just as I would stop a preoccupied person from stepping off a curb into oncoming traffic, it felt appropriate to empower students with all available information regarding their decisions. Particularly if that decision may ultimately affect their enrollment and engagement with the university. This entry was posted in college freshmen, Facebook, higher education, social networks, Twitter. Bookmark the permalink. Agreed, Erik. Just when you think you’re safe because you delete phishing emails and don’t click on spam links, there’s something like this. It takes the fun out of social networking. Thanks for your comment!